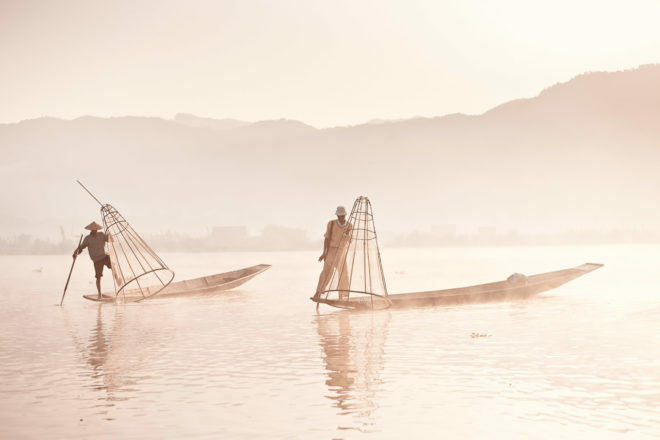 First light hits Inle Lake and the cone-fishermen start their working day. A woman paddles to the market at Taung To. A village on stilts near Nga Phe Kyaung Monastery. 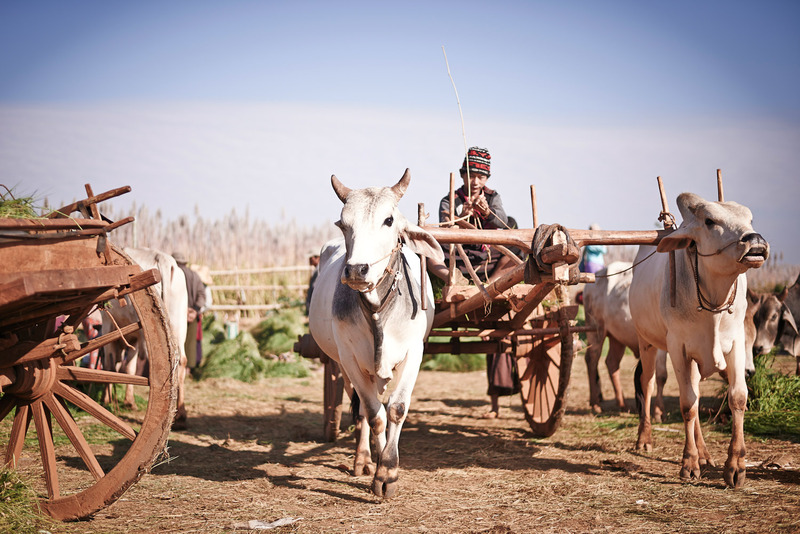 A bullock-drawn cart arrives at Taung To market, Inle Lake. Traditional weaving techniques still at work in Paw Khon. Bolts of weaving cotton in the village of Paw Khon on Inle Lake. Floating gardens and bamboo homes in Taunggyi town, near Inle Lake. Sunset on the floating gardens of Inle Lake. One of the famous cats at Nga Phe Kyaung Monastery, Inle Lake. A monk at Nga Phe Kyaung Monastery. The morning haze blurs the horizon, making today’s cloudless sky barely distinguishable from the lake. Peppering the steel-blue backdrop are rows of bamboo poles (used to fix floating gardens to the lake bed) and cone-hatted fishermen crouching on the nose of their motorised canoes. Minus the drone of our own motorboat and the occasional singing swallow, it’s silent, serene and undeniably picturesque. 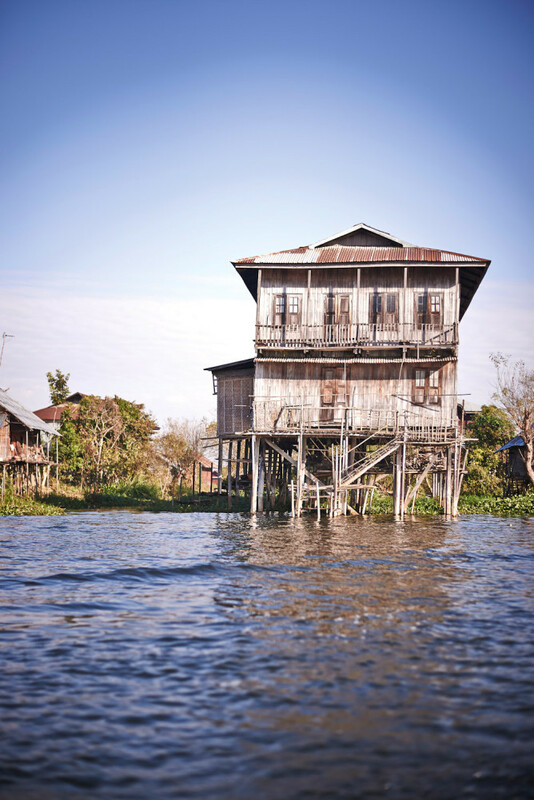 Though Inle Lake is one of Myanmar’s most popular travel destinations, spanning over 116 square kilometres, the country is yet to see visitor numbers anything like that of its neighbouring nations. Sandwiched between Thailand, Laos, China, India and Bangladesh, all of 15,000 Australians travelled to Myanmar in 2014, compared to the half-million who visited Thailand next door. Still relatively new to the tourism game, it’s a destination that has slipped under the radar of most. In the weeks prior to my trip, whenever I tell friends and family of my travel plans, their reaction is much the same: “You’re going where?” Then I mention the country’s former name, Burma. Officially renamed the Republic of the Union of Myanmar in 1989, it’s been largely off-limits due to political unrest that resulted in one of the world’s longest-running civil wars. In the last 100 years alone Myanmar has been run as a British colony, an independent nation, a military dictatorship and, since 2011, a civilian government. Now with a dissolved military junta, democratic elections held in November 2015 that saw Ang San Suu Kyi’s National League for Democracy (NLD) win a majority in parliament, and an established Ministry of Hotels and Tourism, the republic is on the up and open. 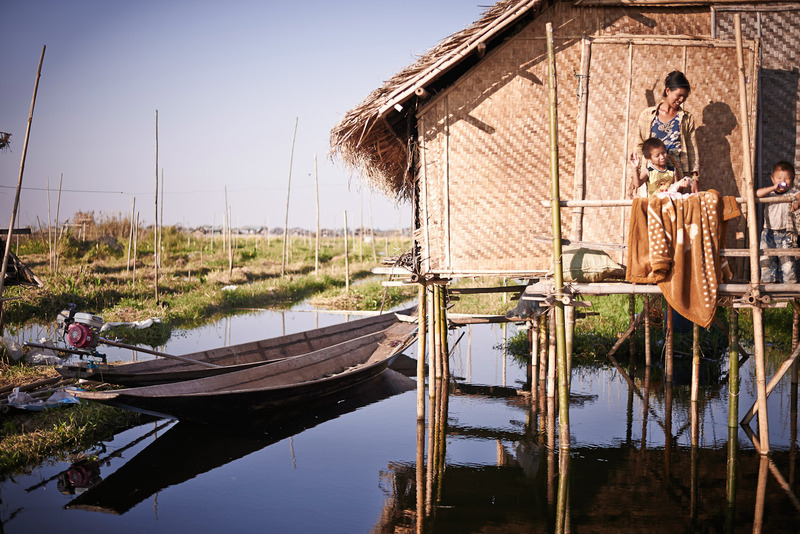 Continuing along Inle Lake’s glassy top, thatched-roofed homes hover on stilts between swathes of floating garden, their reflections rippled away by passing boats. 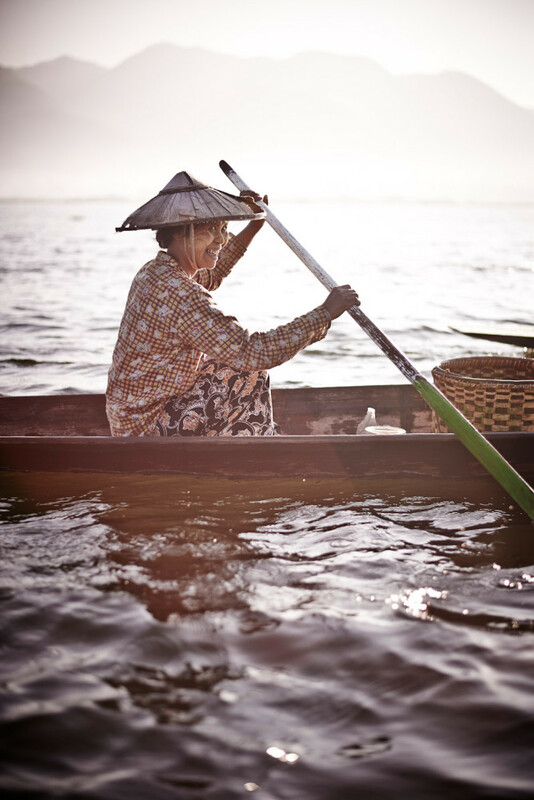 Marking the entrance to each are gnarled timber jetties where women with cheeks smeared in custard-like thanaka sit and wash their laundry. As we deviate off into narrow canals, whirring past boisterous boys frolicking in the shallows and grazing water buffalo, we eventually arrive at the small creek-side village of Indein – home of Inn Thein Pagoda. Here hundreds of ancient, weather-beaten stupas (and newer less-elaborate versions) erupt out of the overgrown setting. “When people have enough money they build stupas as meritorious good deeds,” says our Exo Travel guide and Burmese local, Yè Thiha Thwin. He explains that merit-making plays a pivotal role in Buddhist belief as we wander around the towering structures, spotting only two other visitors in the distance inspecting the brickwork. This isn’t the only or the largest Buddhist sanctuary on Inle Lake, let alone in wider Myanmar. With almost 90 per cent of the population practising Buddhism, Myanmar is one of the most devout Buddhist countries in the world. The landscape glitters with gilded stupas and centuries-old temples, and many more saffron-draped monks and novices. Yè explains that it’s customary for a man to serve in a monastery at least once in his life. The largest and holiest of all such sites is Shwedagon Pagoda; the gold-plated heart and soul of Myanmar’s largest city (and former capital), Yangon, 600 steamy kilometres south of Inle Lake. Said to be over 2500 years old, its imposing gold dome rises 99 metres high, crowned in thousands of emeralds, rubies, diamonds and various other jewels donated by local people. Having survived several earthquakes, a fire and decades of conflict, it serves as both a revered shrine and beacon of hope to Burmese people. Arguably even more iconic than Shwedagon and claiming more ooohs and ahhhs than Inle is Myanmar’s Bagan plains, characterised by thousands of temples and pagodas, built around the 12th century. But Myanmar’s appeal doesn’t lie solely in its past. Fast forward to today and its people are as refreshing as the largely unurbanised landscape. In contrast to the strict militant control that once ruled Myanmar, it seems the people are correspondingly open, welcoming and curious to meet the growing number of travellers roaming their homeland. “If you accidentally leave your phone in a taxi for example, you’re more likely to get it back again here,” says Yè as one by one we climb back into the motorboat. It’s a telling comment about the kind of place this is, especially since mobile phones only reached Myanmar barely three years ago, initially costing several thousand dollars a pop. But as globalisation continues to seep in, sim cards can now be bought for a couple of US dollars, wi-fi (although sluggish) is becoming increasingly widespread, while ever more contemporary car models are chugging along Myanmar’s quiet streets. With visitor numbers on the rise, so too are tourist experiences like our next stop on Inle Lake, Inthar Heritage House. Once docked we saunter along a stained-timber boardwalk, garlanded with bougainvillea vines, towards a buzzing three-storey house on stilts. Modelled off a traditional Burmese home, the upper levels comprise an acclaimed restaurant, a recreation of a traditional bedroom and an art gallery showcasing the works of local artists. However, it’s downstairs that we’ve come to see. Tip-toeing down into a series of timber-clad rooms, we find the tenants sprawled out and sunning themselves on window-side lounges until they notice our arrival. Within seconds a handful of Burmese cats are slinking towards us at the entrance, welcoming us with leg nuzzles. 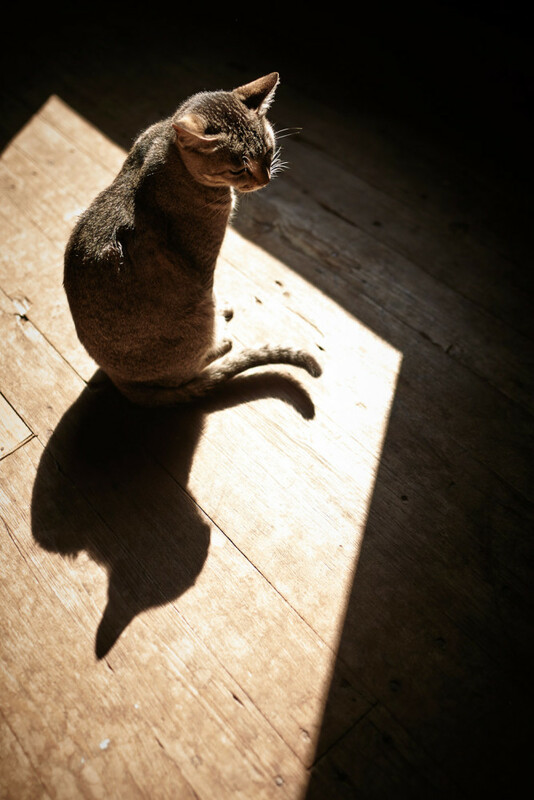 Opened in 2009, Inthar’s cat sanctuary was set up to help breed pure Burmese cats and reintroduce them to their home country after the pedigree died out here after the Second World War. Some chocolate, others smoky and a couple champagne in colour, they prowl around us as we walk through to the outdoor ‘Cat Village’, where more moggies are dozing inside mini palaces overlooking the lake. I crouch down to photograph the golden eyes of one resident, a feature that the Burmese breed are renowned for, when suddenly a delicate bundle leaps up onto my shoulders and curls itself around my neck. It would appear that Burmese cats are also renowned for their affectionate nature. Later that afternoon, when our day on the lake draws to a close, we glide back to our hotel, Novotel Inle Lake Myat Min, the only international hotel to open in the area as yet. Fishermen reel in their last-ditch efforts for tonight’s dinner, while others heave dripping loads of weeds aboard that will be dried and used as fertiliser. 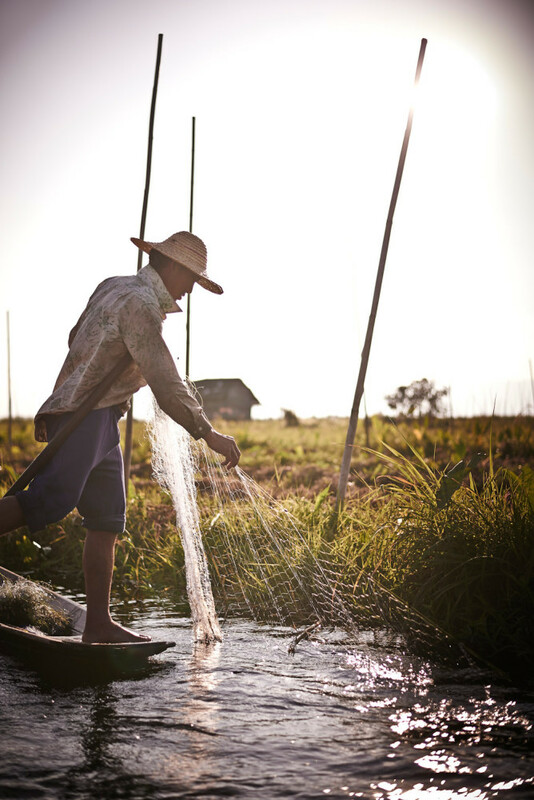 It’s an exciting time to be in Myanmar, witnessing the traditional way of life on the brink of a modernised future, bright as the glowing orb now slowly sinking towards the horizon. With a flock of cormorants flapping overhead before they roost, I hope that in the years to come the appeal of tourist dollars is balanced with the protection necessary to maintain the authenticity of this place. A place that we’ll all soon know the name of. Qantas fly daily between major Australian airports and Singapore, while Jetstar operates flights between Singapore and Yangon daily. Although Myanmar is a relatively new frontier, Jetstar has been flying this route for over 10 years. We stayed with Accor Hotels – one of the few international hotel brands to establish Burmese outposts, including the lavish Hotel Novotel Inle Lake Myat Min on Inle Lake. Accor hotels offer packaged deals with Exo Travel, which guided us through Myanmar. Exo offers tailor-made tours so prices vary widely. Visit exotravel.com for more information. Myanmar is well known for its precious stones, especially rubies and jade, but there are many knock-offs around. If you do pick a gem keepsake, make sure you ask for an official receipt or certificate issued by government-licensed dealers. The export of gems and stones without such documentation is illegal. 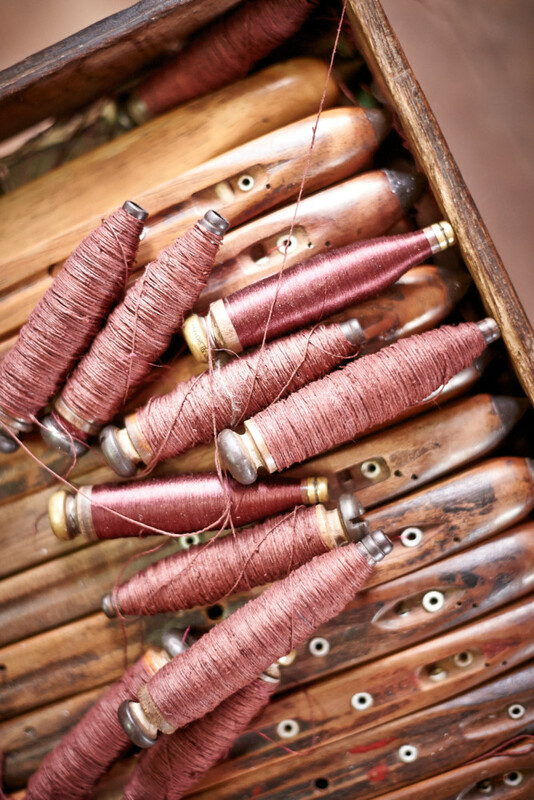 Failing that, you’ll find an array of gorgeous fabrics, scarves and throws at any one of Myanmar’s many markets.